Here is a shot from Glacier a month ago when Ken and I were at the Glacier Institute. This is the spot where a woman slipped on the wet rocks, fell in and drowned the day after we were there. It is marked to not be down on the edge and there is a big sign that says that drowning is the number 1 cause of death in Glacier. People just don’t read signs or believe them, I guess. The water was extremely high and fast flowing at that time. 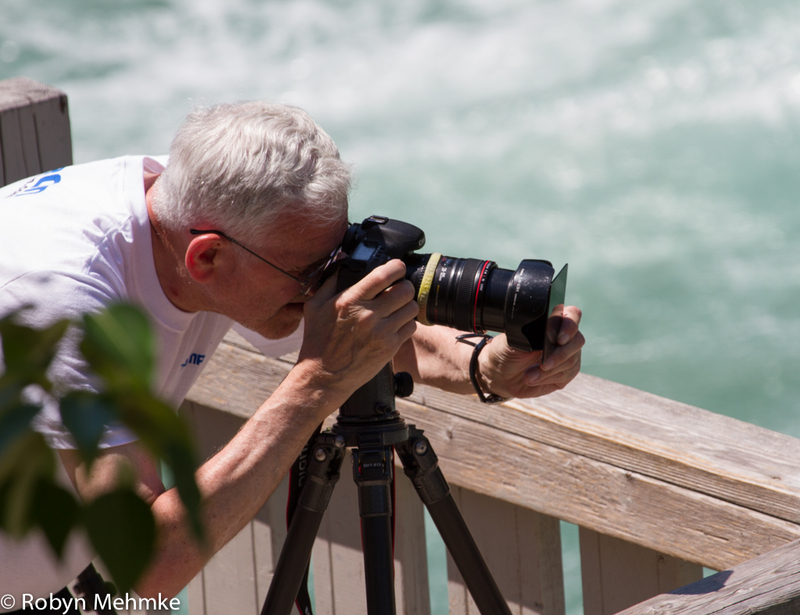 Ken is using a ND (neutral density) filter like Bryan Peterson taught me. No need for a Cokin holder; fingers will work. Today is Dad’s memorial. Still hard to believe he is really gone. It seemed surreal last night listening to Tiffany and Emma practicing the music. My prayers are with my mom. She is so frail both physically and emotionally. This has taken a toll on her. She won’t be at the service, which is best. The next few days need to be spent making sure she is okay. 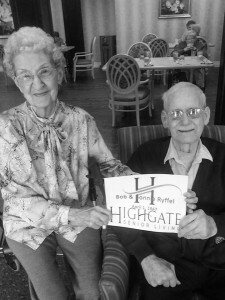 Here is a photo from earlier this year when they were running for the top couple at Highgate. I believe they came in a very close second. 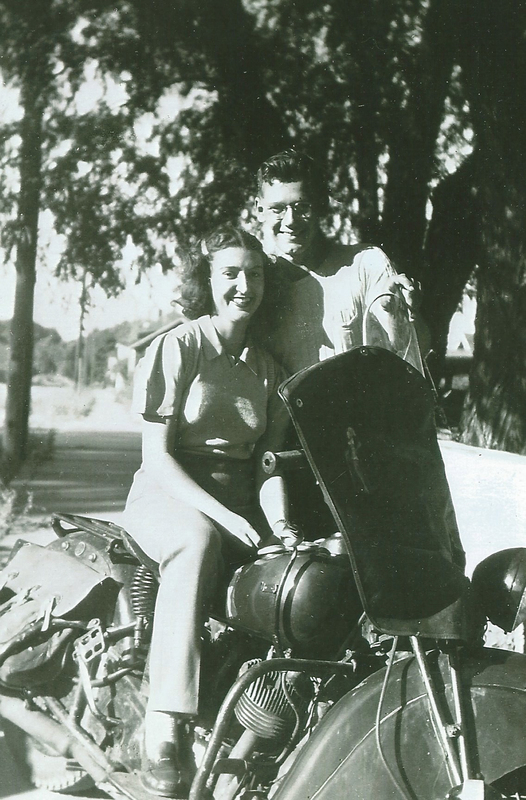 Now days, being married for 67 years is nearly unheard of(actually 69 when you consider their dating years). The two of them have been watching their friends pass away in recent years and very few are left. Life has not been the best for Dad for quite some time. Losing his sight took a horrible toll on him. He loved his books and serving on the Belt Library board. Books on Tape just didn’t cut it with Dad. There was something about the written word to him and the feel of a book in his hands. He had been welcoming death for some time and when it came, it did so very peacefully. My sis and I were there holding his hand and he was gone before we knew it. He would have wanted it that way. 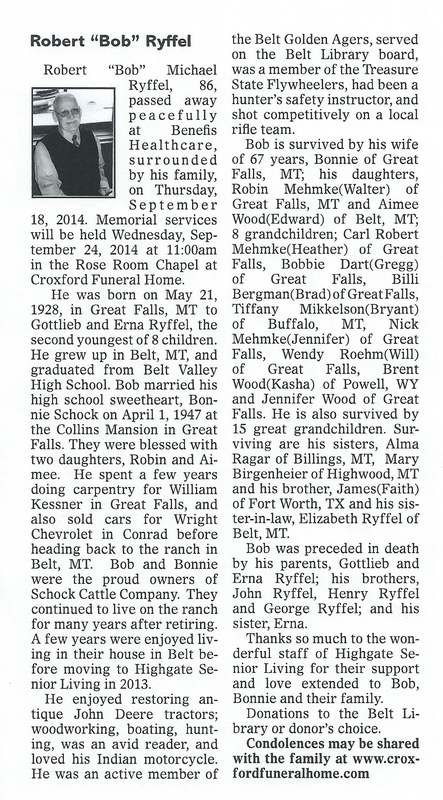 Walter will fly over the ranch later today and spread his ashes. I believe that is where he would want to be. Rest in Peace, Dad. 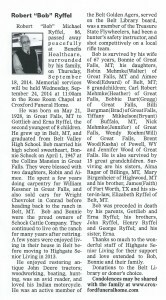 Here is Dad’s obituary that will run in the Tribune tomorrow. I had to keep the word number down, as they charge by the inch! The photo sure pixelated. Guess that is what happens when they put it through the Tribune template and size to fit. Looks good out of the paper though. Here is Dad’s favorite photo of my mom. We are going to use this at the memorial service and have his Indian there too. Walter will fly over the ranch and scatter his ashes there. It is still hard to believe that he is gone. Little did I know that the photo I posted yesterday would be the last one I would take of Dad alive. He left this earth yesterday morning, peacefully holding my hand. I feel so blessed to have had him in my life for all those years. This is a video I made for Mom on her birthday Tuesday when they couldn’t be together. 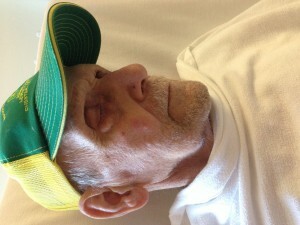 Dad has been in the hospital for 5 days due to a fall at the assisted living he and Mom are living at. Long days and nights. It is now 2am and I am watching him. I just finished a class with Bryan Peterson and this is one of my photos, as well as yesterday’s, that received a perfect picture. Got lots of perfects and I hope I can continue using what I learned. This assignment was taking a feelings word and then going out and photographing something that represents that word. 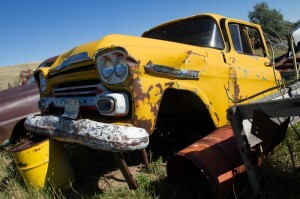 I found this old truck that was leaning on the barrel and a couple of rods. It looks like all once would have to do is kick that barrel and down it would come. Gotta love a junkyard. Junk yards are a dream location for photographers- all that rush and peeling paint are heavenly. I ventured to ours again and got some nice ones. Here is a spring on an old combine. I love the ungroomed grown with weeds and all. 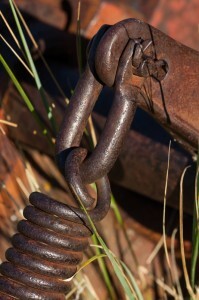 We do have our sheep grazing there now, but they have not damaged that rustic look. Day 252 Happy Birthday, Tiffany! Tiffany had a birthday a few days ago. We celebrated by attending the Chokecherry Festival. It was a great time. Brynn posted this photo for Tiff’s birthday. It shows Brynn with Tiffany when she was a little gal. 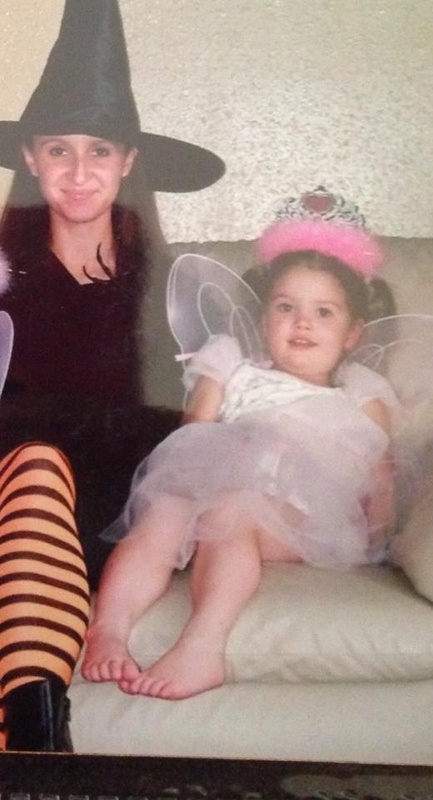 It obviously was Halloween. It sure feels like fall today. Supposed to have our first freeze this week. There will be sheets out on the garden for sure. 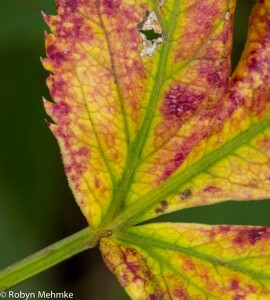 This is a leaf from the macro shoot in Glacier. Can’t help but love the colors, if not the temps, this time of year. You are currently browsing the Window on Cherry Pie Lane weblog archives for September, 2014.